The reliable name you’ve come to trust so well is now available in a unique swivel design that will get the attention of your clients and employees. 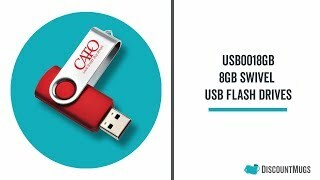 Great promotional gifts you can extend at giveaway events, trade shows and much more, these 8GB USB Flash Drives can be printed or laser engraved with your logo or artwork of choice. Compact and easy to store - they’ll fit practically in any pocket, and are available in 13 color choices that include fuchsia, grey, orange, purple, yellow, green, and others. A small loop lays against silver metal swivel top so you can easy attach lanyards or key rings to keep closely at hand – accessories are sold separately. Get started on your promotional USB Flash Drives of choice today and take advantage of our Free Shipping offer. Great! Thank you. I will recommend using this website annually! These look perfect. Exactly what we wanted! Thanks, gang . . . The logo is awesome & the delivery time was perfect . . . Thanks, again!